Photographer Dorothea Lange takes a break on top of a car during her job for the Farm Security Administration. What do you see when you look through the lens of a camera? Many people take photographs to remember a special occasion. Photographs can also show us what is happening in another country or in our own backyard. 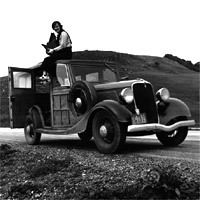 Photographer Dorothea Lange is well known for her pictures of forgotten Americans. She began her career as a studio photographer, but during the Great Depression, Lange took her camera out of the studio and onto the streets. Her photographs of the homeless led to her getting a job in one of the new government agencies established to help those in need.